If you’re looking for a yoga-infused destination, or peaceful retreat to the lowlands of Cundinamarca, then Girardot on a long weekend, especially at the end of the year, will not be your cup of tea. But if cold beers (because there will be many with the scorching heat) and lazing by a pool is your take on a perfect escape, then this town, nestled on the banks of the Magdalena River, is all about celebrating tourism. In 1969, a group of journalists convinced the local council that Girardot needed to host its own pageant, given its proximity to Ibagué, Calarcá and Neiva which all have legendary festivals, celebrating traditional folk music, the coffee harvest, and SanJuanero dance. 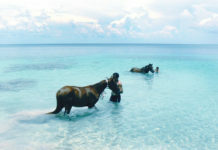 After the success of the first National Tourism Pageant (Reinado Nacional de Turismo), Colombians began to flock to Girardot every October filling up the small hotels. As the festival grew, so too the city’s hotel infrastructure, and today, visitors can appreciate many graceful hotels perched on hillsides, offering spectacular views of the Magdalena. 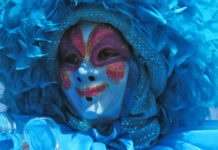 The highlight of the event is a colorful parade with beauty queens who seemingly appear to float on their floats, waving to the crowd and who receive waves of applause, even bouquets of freshly cut flowers, in return. With the backdrop of a meandering river and ornate mansions owned by the new Republic’s first coffee and mining tycoons, Girardot is steeped in memories, especially those of the age of steam and rail transport. A flat river surface also served as a natural runway for German made Dorniers, owned by the Colombo–German Aeronautical Society (SCADTA), as they puddle-jumped the length of the river, bringing to these shores cartographers, engineers, and future plantation owners. The distance between Girardot and Barranquilla is 800 kilometers, but on warm nights, the distance seems much shorter, especially when empty crates of Aguila beer begin to pile up outside local tiendas. At the junction of Cundinamarca and Tolima, Girardot’s main landmarks are the old market and a suspension bridge where locals still go to enjoy an afternoon view of the river or burn-off a typical lunch of stuffed pig with rice, known as lechona. The rise and fall of rail transportation forever changed Girardot, and as an emerging city, tourism would become its main source of revenue. The age of the overland vacation was born. Located 3-hours by car from Bogotá and blessed with year-round hot weather, Girardot’s 47th National Tourism Pageant was attended by some 7,000 tourists who flocked into town to see Angie Moreno, representing the Department of Valle del Cauca, crowned as the national tourism Queen 2017- 2018. 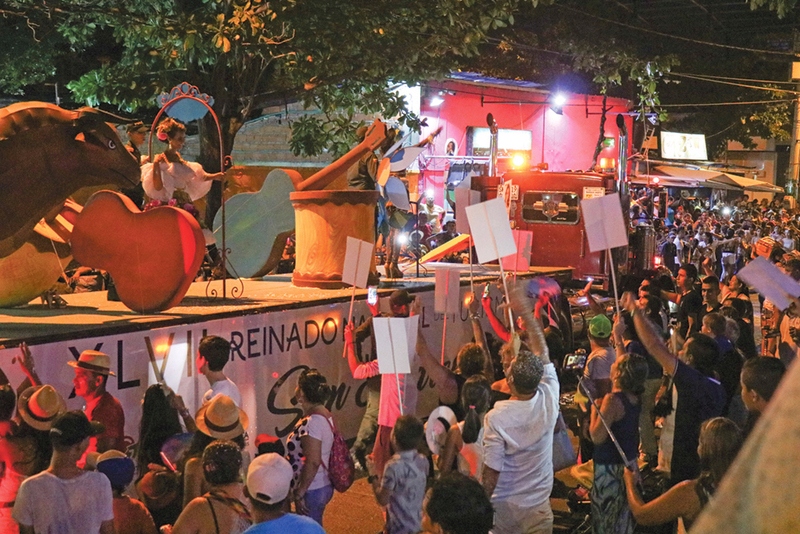 While the beauty pageant candidates made their appearances and an outdoor concert featured local artists, the most visited event is the Noche de la Fantasía parade, winding its way through the old town’s center. This event was first introduced to promote the well-being of Girardot’s most vulnerable citizens. Dressed in the traditional attire from their distinctive regions, the Fantasy Parade celebrates diversity and while onlookers of all generations were cheering on the participants, others were more keen to try the deep fried street food. But for all, there is enormous pride in being in this tropical part of Colombia. “We are incredibly happy to be able to be part of the event and highlight the work of the entire team,” said Julio Reyes, a local craftsman who helped create five parade floats that mirrored the ones from the Barranquilla Carnival, and one float specifically dedicated to the LGBT community. The festival also featured some of Latin America’s best musical groups, including Piso 21, a nationally renowned Reggaeton band from Medellín, and Zion y Lennox, a musical duo from Puerto Rico. The loudspeakers blared music through the night, the Girardoteños celebrated their festival, dancing into the early morning with the dizziness brought on by aguardiente, a sugarcane spirit.